So, is Dubai just like Missouri?! We joke in Missouri that if you don’t like the weather, just hang around a few hours and it will change – and it’s true quite a lot. One morning you’ll be running the furnace because the temps are in the teens (fahrenheit) and by afternoon, the air conditioner is coming on because it’s in the 80s!. In Dubai this week two days ago was sunny, hot, and 98 degrees, next day was sand storm and 96 all day, and early this morning, i woke to the gentle ping of rain on the window. Not much accumulated, but the streets are flooded! Dubai’s annual rainfall is 3.71 inches per year, with March being the second highest rainfall month of a whopping .87 of an inch (March has the most days of rain at 5) However, the past couple years, the annual has risen to nearly 5.91 inches a year. Apparently, UAE is seeding the clouds to hopefully increase the rainfall. Whether or not that is working or if this is just a natural increase we’ll never be know, though i suspect the cloud seeding enthusiasts will be claiming success! Bright sunshine, warm temperatures, water a bit nippy, but several in swimming! Of course today of the Sightseeing tour, it is a sand storm! Eating sand and gritty eyes, but –bonus–no crowds! A bit eery –no one in the restaurant we chose, all those vendors you see in the photo, but not a single shopper. There were a few people enjoying the beach and water, however. This is at the famous Dubai Marina Walk. Only a few tenths causes flooding in Dubai! This morning, we had planned a guided walking tour of the gold and spice souks, but could never make contact with the local company to confirm, so we hopped on the Metro inside Mall of the Emirates and just enjoyed the walk ourselves. It’s in the old part of Dubai, so a bit of history would have been helpful, but…. We hopped a 1 dirham (about 27 cents USD) Abra Boat Ride water taxi ride to the spice and gold souks. Few crowds maybe because it’s a weekday and it had been raining, not sure. But there were plenty of vendors in your face plying their wares. Roping you with cashmere scarves they are pushing (gently remove it and say ‘no thanks’) and an amazing number of young men stepping in front with photos on their phones of ‘purses, watches, sunglasses’ just step back here. yeah, forget about it. I really don’t like that aggressive approach at all, but Jessica and I smile and say, ‘very pretty, no thank you.’ It really stresses Dallas though. His Aspergers kicks in high in these types of situations, so i tend to limit his exposure – it makes him cranky. Lots of pretty things, but i have no need for gold or spices and i’m not educated enough to haggle for any of it, so i buy nothing. One of several spice souks in Dubai. Typical of any big city, there are the ubiquitous Hop On/Hop Off buses, frequently open topped and/or heated or air conditioned with free water, ear buds provided for the narrative in several languages. Dubai is no exception and they have two companies providing the service. Jessica had a buy one/get one free coupon for City Sightseeing so this is the one we went with. There were three crucial points of this touring –friendliness/helpfulness, interesting and informative narrative, and being on time — that this company did well. After that, however, i’ll share what i feel could be done better. Cold water vs warm water to drink and drivers should know when the venue at a particular stop has been closed instead of handing us an admittance ticket and pointing the way. Nevertheless, we enjoyed the tour, though we had to take the entire blue route (2 hours) to get from Dubai Mall to Mall of the Emirates. Tomorrow, we’ll take the same blue route, but transfer to two other routes for the full city tour. Guess, we could have hailed a cab. Included in our tickes was admission to Dubai Aquarium and Zoo at the Dubai Mall. Maybe i’m jaded by all the zoos, aquariums, etc we’ve been too as the children were growing up, but these were a bit lackluster, although it did seem that the famiies with young children were having a great time. Most of the aquarium can be seen for free — ya gotta pay to walk under the aquarium and tour the zoo part. And you’ll be accosted for photographing at least three times. Maybe i was getting tired, but i sure was getting a bit short tempered with that nonsense. Jessica has frisbie practice first thing this morning, so it’s off to Palace Beach on the Persian Gulf for this clan. A popular beach for families and campers, though it offers no amenities, including toilets! Kicking back on Palace Beach – working on my March tan! View from the 160th floor of the Burj Khalifa. Lights of the city from the 124th floor! Just outside the developed areas, the desert looms! The city of Dubai has a population of 2.736 million people. Church on Friday? and the desert. Another action packed day starting with praise and worship at a local assembly – Fellowship of the Emirates. Great band, contemporary songs, good message. I don’t agree with the whole ‘easter’ thing, but there is little doubt these people love the Father. One thing these awesome outreach ministries really need to be mindful of is remembering to teach ‘repentence.’ Too many times, ministries leave that critical component out of the Good News. With over 500 people attending this 9am service and more expected at the 11am service, there is quite a movement of diverse cultures and people all worshiping together, bringing together all age groups and backgrounds. I would not be surprised if nearly every country in the world was represented in this one serivce. Safa Park was our next stop after church and dropping off Jessica’s friend Deseret at her apartment. Although touted as a complete escape from Dubai, it is right down town and surrounded by traffic noise, but it is large and lots of greenery, handcraft vendors, and of course delicious food! Resting up for our big afternoon and evening adventure with Platinum Heritage Desert Tours. Don’t even hesitate to book the tour of your choice – totally impressed with this outfit! Our driver/tour guide/waiter Ericson is a perfect host and our travel mates from Lisbon were fun! 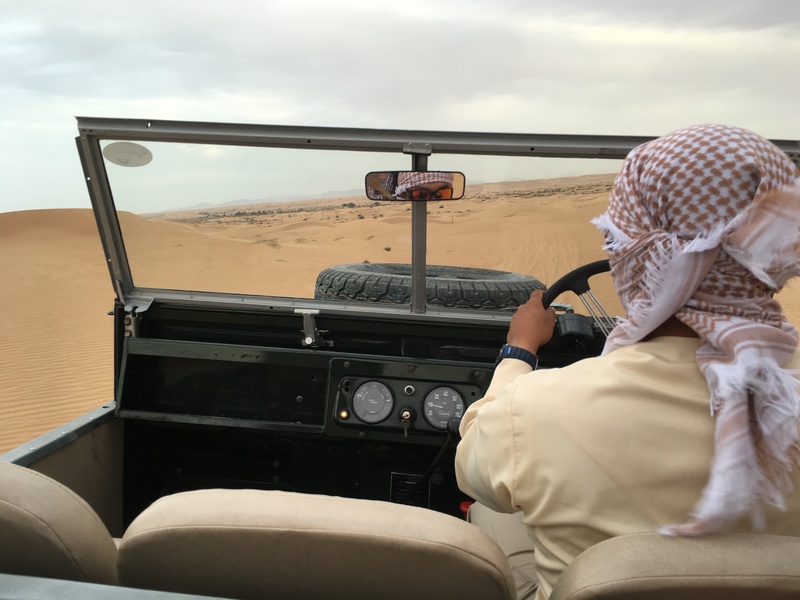 There are several tours from which to choose, we experienced the Evening Desert Safari Dubai. Definitely book in advance, they fill spots quickly. Jessica enjoying her sparkling apple juice in anticipation of the falconry exhibition. Alcohol is illegal in public places. I’m having my hand decorated with henna. This lady created beautiful work in a matter of seconds! The Platinum Heritage Desert Safari takes place in this Conservation Reserve. Off we go into the desert with Ericson at the wheel! Smoking shisha. It’s a pleasant smoke, ours with a minty flavour. It can make one a bit dizzy. 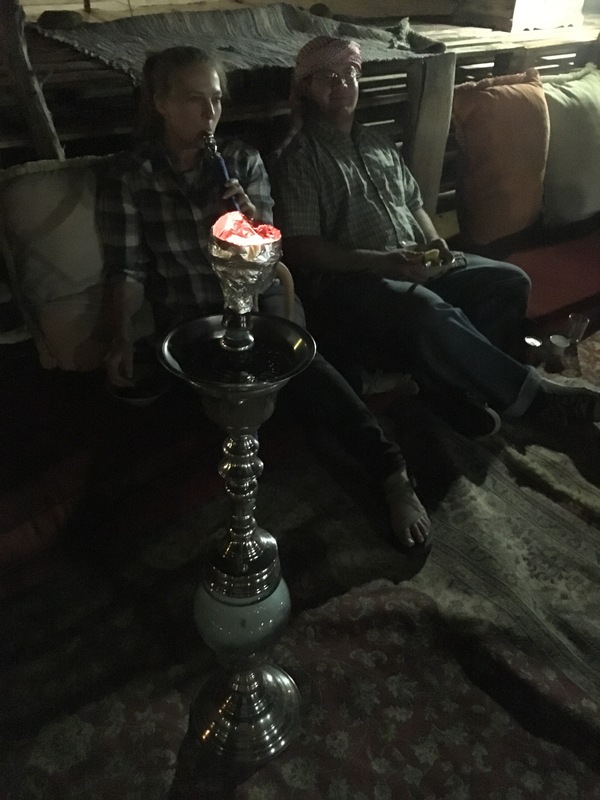 They say an hour of smoking shisha is equivalent to 200 cigarettes. Best not get addicted! 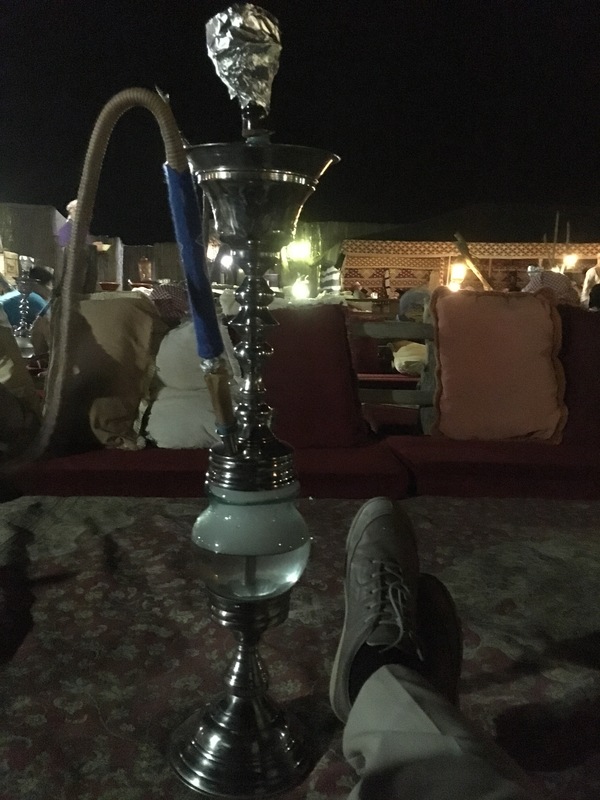 Me with my Ecco shoes lounging on pillows in traditional Bedouin fashion smoking shisha! The evening ends in saying goodbye to our guide and new friends from Lisbon, Portugal. Typically cloudless and sunny, we were greeted to cloudy and windy with air infused sand and dust! Up early, but slow start. Jessica is off to work at her kindergarten teaching job at Dubai American Academy literally a five minute walk from her apartment to her classroom! Today, (Thursday and the last day of the week) was parent-teacher conferences, so Dallas and I were treated to a real tour of her classroom, school, and met a few of her teacher friends. After spending some time wandering around the area, we were back to the apartment for a nap. Jessica returned in the mid afternoon and she had plans to walk our feet off. First to Dubai Miracle Garden – the wind was wicked with sand and dust absolutely a challenge for eyes and throats. Some people were wearing face masks. Yes, the garden is touristy, but judging from the number of families, I suspect many were locals looking for a bit of color and escape from the concrete jungle of everyday. The air quality inside the garden was aided by tall trees surrounding the park. Dubai Miracle Garden – Emirates Airline has teamed up with Dubai Miracle Garden to construct the world’s largest floral installation through a life-size version of the Emirates A380, covered in more than 500,000 fresh flowers and living plants. When in full bloom, the aircraft structure will have an unprecedented total stem count of 5 million flowers and will weigh over 100 tonnes (take-off weight of an actual A380 is 575 tonnes). Dubai Miracle Garden – small replica of the Burj Khalifa, the world’s tallest building, surrounded by masses of beautiful flowers infusing the whole area with pleasant sights and smells. Just before dusk, we drove then to Global Village – This park opens at 5pm, because truly it is best enjoyed after dark to appreciate the lights, sounds, action, and each country providing quality dance exhibitions all included in your ticket. Mostly, this is a chance for countries to sell and promote their wares, but it was fun to peruse the stalls. Bear in mind, we Westerners are not all that used to hawkers and they are in full force. Just politely say no thank you (sometimes multiple times) and move on or jump in for the thrill of snagging a great deal.